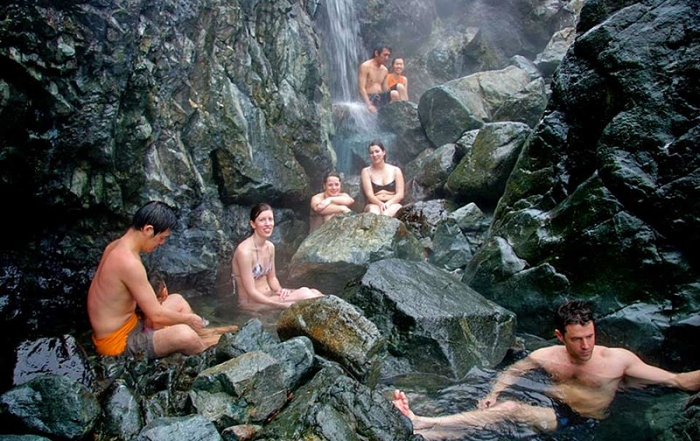 Hot Springs Cove is a splendid hot spring still enjoyable in its natural state, located in Maquinna Provincial Park in the remote northern end of Clayoquot Sound. The boiling spring water bubbles up from deep in the earth and cascades down a small cliff into a series of natural layered rock pools, cooled by the incoming Pacific Ocean surf, each pool slightly cooler than the one above it. At high tide the surf surges up into the two lower pools creating a unique blend of hot and cool water.This tidal action also flushes the pools twice daily, so they are always noticeably clean. The spring water is very hot (47 degrees Celcius, 117 degrees Fahrenheit), and is clear with just a faint smell and taste of sulphur. This soothing, natural wonder is open year-round and is accessible only by air or by sea (one-hour water taxi ride from Tofino). The hotsprings are reached by an easy hike on a 2-km attractive wooden boardwalk trail from the dock. 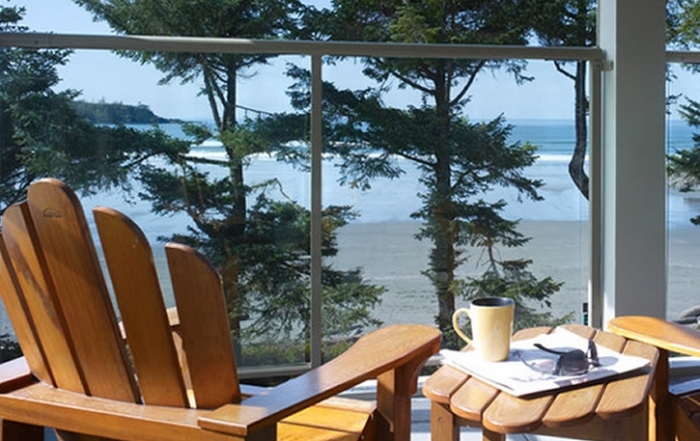 A selection of transport packages is offered out of Tofino, combining aerial sightseeing, camping, whale watching and kayaking with the magical experience of a mineral steam bath surrounded by old-growth rain forest. Hot Springs Cove is a refreshing stop for kayakers paddling through the Flores and Vargas Islands, and for those seeking a less strenuous visit, accommodation can be sought at a nearby lodge operated by the Hesquiat First Nations. Guests of the lodge are permitted access to the two-mile, well-marked, wilderness trail to Tsamata Beach, to spend time strolling through the uncut forest and exploring the undisturbed shoreline. There are huge ancient cedars, towering Douglas firs, and spruces, some draped with Spanish moss. The air is thick and humid, and everything is lush, damp, green and growing. 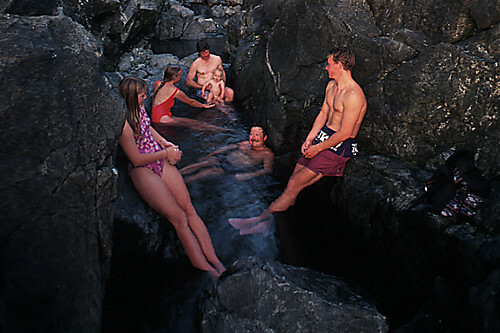 Hot Springs Cove is a very popular attraction on the west coast, so a visit during fall and winter will provide more privacy. The mineral water sustains numerous micro-organisms that could affect your eyes, ears and throat, and protective footwear is recommended in the rock pools – rubber-soled aquashoes are best. Bathing suits are not always worn. Following a 4.8-magnitude earthquake on Wednesday, 7 January, 2015, felt on the west coast of Vancouver Island that hit 18 kilometres east-northeast of Tofino at a depth of 24 kilometres, the water at Hot Springs Cove cooled off for a day or two, and the sulphur smell was gone. Officials of the Hesquiaht First Nation advised that the water temperature had increased substantially by the Friday, and by Saturday, 10 January, 2015, Hot Springs Cove was back to its normal, steaming, delightful best. Hot Springs Cove is located in Maquinna Provincial Marine Park at the remote northern end of Clayoquot Sound, north of Tofino on the west coast of Vancouver Island.